Alcohol and drugs abuse in the workplace is a growing problem that disrupts teamwork, reduces productivity, damages customer relationships and, ultimately, shrinks profits. Perhaps most importantly, it poses a real risk to the health and safety of fellow workers, and to the individuals responsible. Eurofins Workplace Drug Testing (EWDT) offers a complete service for pre-employment, random and ‘for cause’ workplace screening, with expert interpretation and the ability to find and associate other important factors to substantiate positive results. Our standards are extremely high and all of our laboratory systems, procedures and workplace screening kits comply with guidelines for legally defensible workplace drug testing. 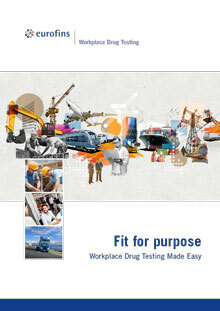 We provide drug and alcohol testing services to many different industries. Using toxicological expertise to interpret results and the latest analytical technology to detect the presence of a wide range of substances. We apply a wealth of scientific techniques, skills and expertise to help you drive drugs and alcohol from the workplace. We understand the regulatory requirements relating to industry sectors including the Health & Safety at Work Act 1974, Transport & Works Act 1992, The Railway & Safety Standards Board Group Standard GE/RT 8070, Railways and Transport Safety Act 2003, Road Traffic Act 1988, Corporate Manslaughter Act 2008, Misuse of Drugs Act 1971, and Psychoactive Substances Act 2016. EWDT will help you develop workplace policies that are thorough, practical and acceptable to your workforce, whilst ensuring that the approach aligns with your management processes. We are committed to delivering the highest quality scientific services. All our laboratory systems and procedures and workplace screening kits comply with UK Guidelines for legally defensible workplace drug testing; comprehensive chain of custody processes ensures sample integrity. Please download our brochure or email for further information.